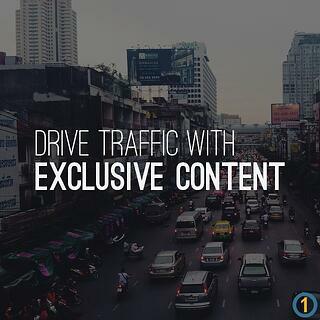 A great way to network your traffic through well known outlets on the Internet is to create exclusive content in which your page is used as a tagged source for write-ups or imagery. Offering a well researched source an exclusive piece will arouse their attention and interest to put your message in the spotlight. Q: What do business owners and marketers want more than anything? In today’s media rich world, one of the moresuccessful ways of gaining more customers is to drive more traffic to your website. Q: So how exactly do you go about creating content that will draw attention and clicks? Once you select a potential content host, craft a well worded message that will instigate the curiosity of whomever you are trying to network with. The language that you use is the most important aspect of creating the realm of exclusivity. Now create the content. Create something that, through your research, is something that you know your content host will be interested in and want to share with their audience. By handing off responsive designed content that can easily be customized, you will be able to successfully pre-pitch your key influences allowing the potential for a domino effect of traffic coming to your page. Focusing on the value of media relations and how you can market your company from a PR standpoint through unique and interesting content will not only spread the word about your brand’s message, but also will catch the attention of other companies or bloggers along with whatever following they may have.